Do you speak a DP language? If so, which one? Yes. Not perfectly- but good enough. French. I REALLY need to get better though. My teacher gives me b+ but that's not awesome. ^ I'LL ask the question. I can't really describe my memory. I am bad at memorizing math and I think I have short term memory loss. But I am good at remembering things from a long time ago, like the strangest details from my childhood. No, I think it's boring. A flaw you can't accept in a friend? So I just give up and move on to the friends I'm still close too. Types of books you read? Which Disney thing (anything, Mickey Mouse, a movie, a prince...) did you used to LOVE but then got over it as you grew up? I used to love Ariel. SHE was my favorite DP until I was like 10. When I was 11, that title went back to Mulan. Who remembers that show called 'Dave the Barbarian'? Favourite song from Lady Antebellum? Lookin' For A Good Time. Do you live in a safe or violent neighborhood? When I was a kid I did not live in a neighborhood, I lived out in the country surrounded by pastures and cows. We live in one now and I guess it is relatively safe, I still keep an eye on the kids and don't let them out of my sight.....I prefer the country, I don't like living so close to people and busy streets. Have you read The Witches? If you're talking about the Roald Dahl book, yes :D Second one I read of him, I would read it everyday at school 'till I finally finished it. My favorite flavors would have to be the ones that taste like a certain soda. What food do you regularly run out of? Croissants or HoneyComb cereal. You can only eat 4 bowls and the entire cereal is gone! Honestly, I see Belle and Tiana becoming one of us if they DID live in the real life like we do. Do you have any new arrivals/additions coming in your family soon? If you are talking about my household family than no. But my 3rd cousin recently got a baby. Oh my god, this is so hard. If your not counting desert then I'm going to say stuffed grape leaves. It's called warak Diwali in arabic but it is so good. Grape leaves stuffed with rice and chicken, yum! Darn it, I'm getting hungry right now! I love we are one and love will find a way from lion king 2. I really like the lady and the tramp 2 songs. I have others I like but those are my favorite. Song that always gets stuck in your head? Hm, hard to pick. Probably 'Just Can't Wait to Be King". Yes, I am a girl. Do you like history? If so, do you like European History? I do its just so incredibly interesting to see and learn everything about Earth's past. European... um.... sure I suppose I rarely do look at other countries history aside from where I live, but yeah I find European history interesting. Don't really have a favorite, I'm not a fan of it, I think X factor is better. There's too many to name! Nope, I really love my town! Yes. Especially after i'm known when the test day is. I procrastinate on purpose everyday before the last 2 days o study. Then I cram hard. What's your biggest fear? (Please do not say no.) Why? Well I don't want to describe my personal fears like death and stuff so I'll name a different one. I am terrified of spiders. Ugh, I know they eat bugs but I just wish they weren't on this planet. I have a HUGE fear, Everytime I see one I start to freak out and shake like a dog. I hate spiders, they make my skin crawl. Do you have sloppy, average, or neat handwriting? I am left handed and everyone for some reason thinks I am super human. It gets annoying, like I'm at my friends house and they see me writing amd they stare at me like I did magic. It's always the same thing: "Oh my god, your left handed? That is so cool" But I am not left handed for everything, just for eating and writing and other stuff. I finally know how to do some things with my right hand but not that much. How many kids would you want? Eight at the most and two at the least. If you could name your kids after a Disney Character who would you name them after? 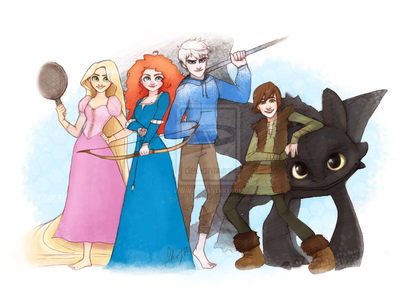 I'd name the girl after Merida and the boy after Naveen. Have you seen Batman and Robin? If so, do you like it? No, I don't like those type of movies. What would you rather wear, contacts or glasses? I have wore both glasses and contacts but I prefer to wear glasses. That is what I currently wear. What is your favorite Disney cat? Who is your first crush? Well to release stress? Umm..listening my favorite musics! Do you have any siblings? If yes, how many and what genders. 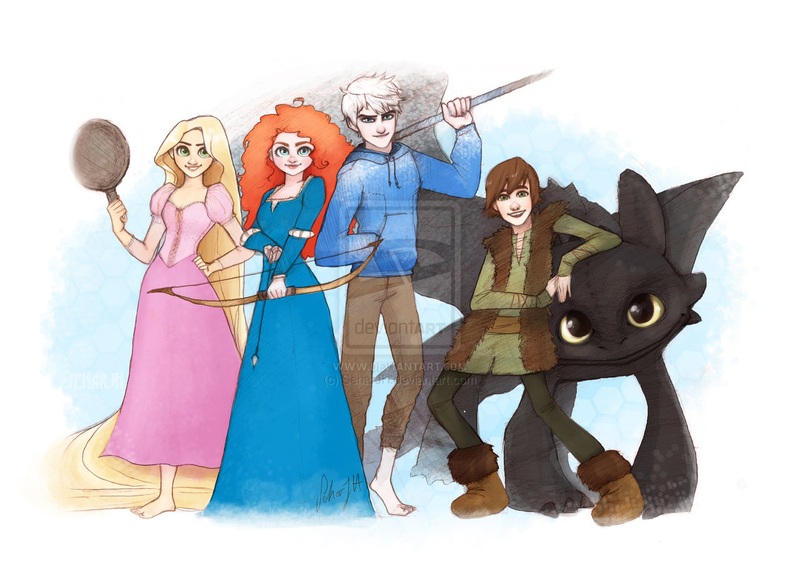 What do you think of the crossover between Hiccup (How to train your dragon), Rapunzel (Tangled), Merida ( Brave), and Jack Frost (Rise of the Guardians)? Do you approve of this fan base growing? Or have you never heard of this pairing among friends? Who created such a fan base anyway? And what is it even supposed to be about? Do you have a bad habit? If so, what is it? Do you prefer movies with happy endings or sad endings?